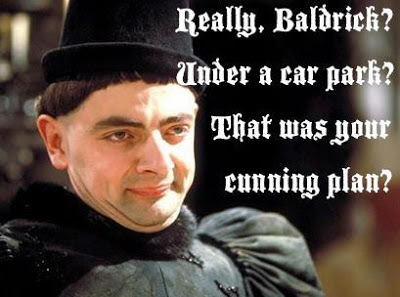 I saw the live broadcast of the announcement of the body under the car park being that of Richard III yesterday through the BBC live stream. It is true, the only thing I could think of was that Blackadder episode The Foretelling. stuck up a tree somewhere in Rutland." "and my uncle under a car park in Leicester".